Photo Credit: Ronda Walker's Facebook page. 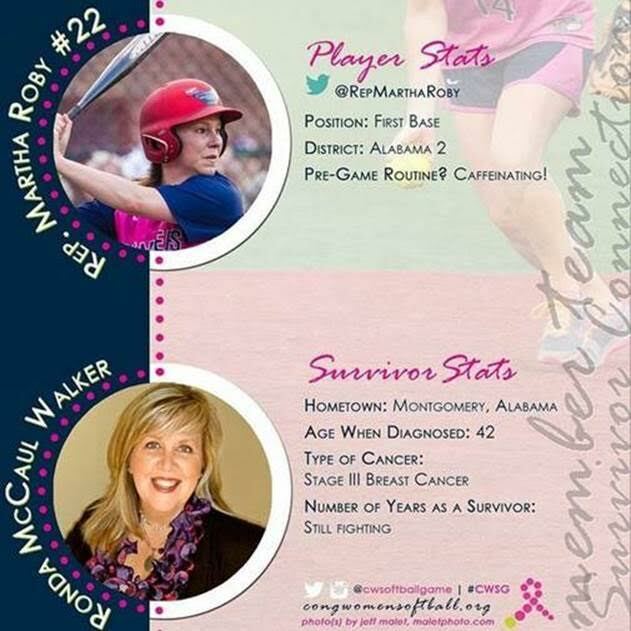 U.S. Rep. Martha Roby announced Monday that she will be batting for Montgomery County Commissioner Ronda Walker at the seventh annual Congressional Women’s Softball Game. Walker will attend the game with Roby on June 24 at 6 p.m. (Eastern) at Watkins Recreation Center off the Eastern Market Metro in Washington, D.C.
Walker was a district field staffer for Roby for several years before she was appointed by Alabama Gov. Robert Bentley to the Montgomery County Commission, and the two have remained close friends since. Ronda has been sharing her journey to fight breast cancer through her blog “Merry Christmas Cancer” and on her Facebook page since announcing her diagnosis just before Christmas. Last week she underwent surgery as part of her 3-step treatment process. “When Ronda told me in December that she had been diagnosed with breast cancer, my heart sank,” Roby said. “My first thought was about the difficult road ahead she and her family would face in fighting this terrible disease. But, her openness in sharing her story and her faith with friends and reporters alike has been inspiring. Some background on the game from http://www.congwomensoftball.org/. The Congressional Women’s Softball Game began in 2009 with captains Rep. Debbie Wasserman Schultz (D-FL), Rep. Jo Ann Emerson (R-MO), Sen. Kirsten Gillibrand (D-NY) and Sen. Susan Collins (R-ME). They brought together a team of women Members of Congress to play the female campaign staff from both parties after Debbie Wasserman Schultz announced her own battle with breast cancer. In 2010, the Members asked the women of the Washington, D.C. press corps to join the game as the opponent and a lasting rival was born.The Congressional Women’s Softball Game has raised more than $500,000 for Young Survival Coalition (YSC) each year and become a staple of Capitol Hill summer activities. YSC is the premier global organization dedicated to the critical issues unique to young women who are diagnosed with breast cancer. They offer resources, connections and outreach so women feel supported, empowered and hopeful.Breast cancer is something few young women ever think will happen to them– and certainly not at such an early age. When faced with a diagnosis, they may feel confused, angry and isolated. YSC is a place where women can go to find a circle of support and the best information available to navigate their treatment and their lives. @AlabamaToday Here’s hoping @repmartharoby doesn’t get hit in the head by a breaking bat, or poorly thrown ball. She might get some sense.